Our traditional 5 day residential Cookery Course. Chalet Hosts, Self Catering students, Galley Slaves and Nannies are among those who have found the skills they gained with us invaluable. We run many other courses including a range for children of all ages. Adults courses and demonstrations on many topics. 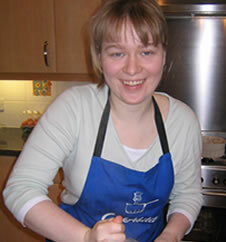 Individual cookery classes can be arranged. Gift tokens are available for all classes. The Pop up restaurant is popular and often open for occasions parties such as birthdays and staff parties. Our cookery courses are designed to teach the basics of cookery - and beyond - and will enable you to cook for yourself and others with ease and confidence. You can use our 5 day residential courses for your Gold D of E Award, Creative hours for the I B, St John Grand Prior Award, Queen's Scout, Queen's Guide or other awarding body schemes. Students regularly come to us from the farthest reaches of the UK and Europe, with student railcards and cheap flights readily available you are never too far away. Just remember to book early! The course is an activity based, personal training program approved for the Residential Project for your Gold D of E Award.